Fiat 4 HP (1899) is the first model of car produced by Fiat. 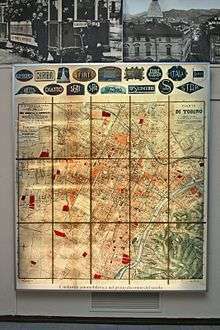 Map of automobile industry in Turin, Italy in the 1910s. The automotive industry in Italy is a quite large employer in the country, it had over 2,131 firms and employed almost 250,000 people in 2006. 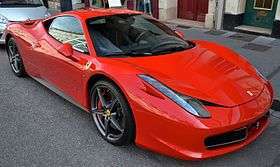 Italy's automotive industry is best known of its automobile designs and small city cars, sports and supercars. The automotive industry makes a contribution of 8.5% to Italian GDP. Italy is one of the significant automobile producers in Europe and the World. Today the Italian automotive industry is almost totally dominated by Fiat Group; in 2001 over 90% of vehicles were produced by it. As well as its own, predominantly mass market model range, Fiat owns the upmarket Alfa Romeo and Lancia brands and the exotic Ferrari and Maserati. Italian cars won in the European Car of the Year annual award one of the most times among other countries (including Fiat most that any other manufacturer) and in World Car of the Year award also. The Italian automotive industry started in the late 1880s, with the Stefanini-Martina regarded as the first manufacturer although Enrico Bernardi had built a petrol fueled tri-cycle in 1884. In 1888 Giovanni Battista Ceirano started building Welleyes bicycles, so named because English names had more sales appeal, and in October 1898 he co-founded Ceirano GB & C with his brothers Matteo, and Ernesto to build the Welleyes motor car. As they encountered challenges of scale and finance they contacted a consortium of local nobility and business-men led by Giovanni Agnelli and in July 1899 Fiat SpA purchased the plant, design and patents - so producing the first F.I.A.T. - the Fiat 4 HP. The Welleyes / F.I.A.T 4 HP had a 679 cc engine and was capable of 35 km/h (22 mph). Isotta Fraschini was founded in 1900, at first assembling Renault model automobiles. The automobile industry grew quickly and manufacturers included Aquila Italiana, Fratelli Ceirano, Società Anonima Italiana Darracq - Darracq, Diatto, Itala, Junior, Lancia, Società Ceirano Automobili Torino, S.T.A.R. Rapid, SPA, and Zust. During the first and the second World Wars and the economic crisis of the 70's, many of these brands disappeared or were bought by FIAT or foreign manufacturers. Over the years Italian automobile industry has also been involved in numerous enterprises outside Italy, many of which have involved the production of Fiat-based models, including Lada in Russia, Zastava and Yugo in the former Yugoslavia, FSO (Polski Fiat) in Poland and SEAT (now part of Volkswagen) in Spain. In the 1960s and 1970s Italy restored own large auto industry that was 3rd-4th in Europe and 5th-6th in the World. In 1980s Italy overtook the United Kingdom but has conceded to Soviet Union that, like Spain, Poland and Yugoslavia, found large-volume production of cars by Italian FIAT help. The 1970s and 1980s were a time of great change for the car industry in Europe. Rear-wheel drive, particularly on family cars, gradually gave way to front-wheel drive. The hatchback bodystyle, first seen on the Renault 16 from France in 1965, became the most popular bodystyle on smaller cars by the mid 1980s. 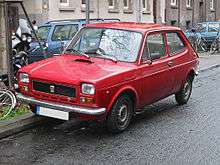 Fiat moved into the hatchback market at the small car end in 1971 with the 127 hatchback, followed by the Ritmo family car in 1978. By the end of the decade, the more upmarket Alfa Romeo and Lancia marques had also added hatchbacks to their ranges. The Italian motor industry's flair for innovative design continued in the 1980s, with its Uno supermini (1983) and Tipo family hatchback (1988) both being voted European Car of the Year mostly in recognition of their up-to-date and practical designs. The Uno was one of the most popular cars in Europe throughout its production life, although the Tipo was not so popular outside Italy. The Uno's replacement, the Punto, was launched at the end of 1993 and achieved similar success to its predecessor, while its earlier Cinquecento played a big part in boosting the size of the city car sector in Europe during the 1990s. It entered the new compact MPV market in 1998 with the quirky six-seater Multipla, having already entered the full size MPV market halfway through the decade with the Eurovan as part of a venture with Peugeot. In 1990s Italian auto industry became again 3rd in Europe and 5th in World with annual output near 2 million (with 2,220,774 maximum in 1989). But in 2011 it fell below 800,000 for the first time in half a century and is now 8th place in Europe and 21st place in the World. Italy today remains one of the significant players of car design and technology, and Fiat has large investments outside Italy including 100% stake in the American automaker Chrysler as of January 2014. 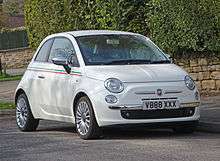 Fiat's fortunes have been helped since 2007 by the huge success across Europe of its new Fiat 500 city car, although the 500 is manufactured in Poland and Mexico, rather than in Italy. ↑ "ITALY'S AUTOMOTIVE INDUSTRY IS BlACK ON THE ROAD THANKS TO EXPORTS". italtrade.com. Archived from the original on 11 January 2008. Retrieved 2008-02-06. ↑ "Country Profiles > ITALY". acea.thisconnect.com. Archived from the original on 11 February 2008. Retrieved 2008-02-09. ↑ "Other European developments". britannica.com. Archived from the original on 2 January 2008. Retrieved 2007-12-23. ↑ "The history of Fiat". carsfromitaly.net. Retrieved 2007-12-23. ↑ J. Bradford DeLong. "Slouching Towards Utopia? : The Economic History of the Twentieth Century". econ161.berkeley.edu. Archived from the original on 2008-05-09. Retrieved 2008-02-06.